An Ghaeltacht are the 2017 AIB Munster Intermediate Club Football champions after a more than convincing 22 point win over St Senans of Limerick on Sunday afternoon in Tralee. The game was in An Ghaeltacht’s favour straight from the start as they won the throw in and pushed forward immediately but Seán Ó Gairbhí hit his shot just wide of the goal. Just thirty seconds later Dara Ó Sé managed to point from play to give An Ghaeltacht the lead and the West Kerry side were rampant in the early exchanges and just before the second minute raised the green flag, Seán Ó Gairbhí hit a lovely pass inside on his left foot as Brian Ó Beaglaoich tore through the St Senans defence and finished at the second time of asking past the keeper. Dara Ó Se was edging the tie An Ghaeltacht’s way, putting over another two points with the second being a fantastic team effort starting with a great long pass by Peter Paul Sauerland toward Eanna Ó Conchúir who used his pace to latch on to the pass before he spotted Dara Ó Se making a run and pointing from play. Ó Se got yet another score in the 5th minute as An Ghaeltacht led 1-4 to no score. St Senans finally put a score on the board as Ian Ryan managed to point in the 7th minute. Further scores by Eanna Ó Conchúir, Seán Ó Gairbhí and PJ. Mac Láimh had An Ghaeltacht in cruise control as they lead by 9 points midway through the half. Senans looked deflated in the half but managed their second score in the 18th minute as Richard Hayes pointed from a free. As Senans looked to start a comeback, An Ghaeltacht laid siege to the goal putting over four more points stretching their lead to 12 points by the 24th minute. St Senans day went from bad to worse as Roibeard Ó Sé collected a loose ball, and hit a beautiful low curling shot into the bottom corner to raise the green flag. Further points from Sean M. Ó Conchúir, Tomas Ó Sé and Dara O Sé had An Ghaeltacht ahead by 18 points at the break; 2-14 to 0-2. From the restart An Ghaeltacht remained ruthless in their scoring intents as further scores by Peter Paul Sauerland, Sean Ó Bambaire and the inform Dara Ó Sé (2) had the game over as a contest by the 36th minute. Senans doubled their tally with back to back scores by Sean McSweeney and Ray Flaherty but they still trailed by 20 points by the 40th minute. The wind was certainly in the sails of An Ghaeltacht as Dara Ó Sé and Eanna Ó Conchúir sent over two more scores as Senans looked down and out. With 46 minutes played An Ghaeltacht had their third and final goal as PJ Mac Láimh sent the ball into the net following a great passing move. Three scores late on for St Senans by Seamus McSweeney, Ian Ryan and Richard Hayes gave the away support something to cheer about, but it was An Ghaeltacht who prevailed as they won out 3-21 to 0-8. 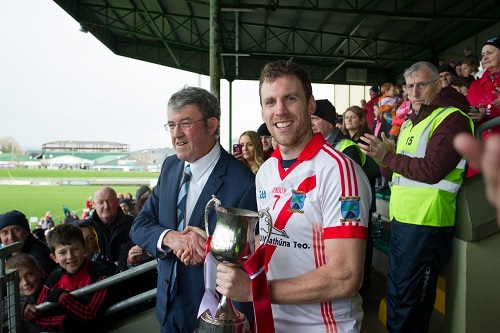 After the game, Corn Ristéard Ó Cuimín was presented to winning captain Colm Ó Muirceartaigh by leas cathaoirleach Comhairle na Mumhan, Liam Lenihan. The Chorca Dhuibhne side now advance to the All Ireland semi final on February 3rd where they meet Tyrone champions, Moy who defeated Rostrevor today by a point 0-9 to 0-8. St Senans: I. Ryan 0-2, S. McSweeney (2 F) and R. Hayes (1 F) 0-2 each, A. Kerins 0-1. A. Russell, D. Conroy, J. Bridgeman, D. Finnerty, G. Hanlon, I. Ryan, R. Flaherty, M. Fitzgerald, S. O’Connell, O. Wallace, A. Mulvihill, S. McSweeney, J. Naughton, C. Mullane, R. Hayes.